and placed them in proper subdomain directories. However, whenever I type http://www.mysubdomain.mysite.com, I'm redirected to Sentora login page. I'm guessing that something takes precedence over the rules I've setup, but I'm unsure how to fix it. I was thinking of making changes in httpd-vhosts.conf, through Sentora admin panel, and setting the redirections there, but I'm unsure whether that would solve my problems. This redirection is needed, because I have users who keep typing (or calling it from their bookmarks) the www prefix. php_subdomain_value suhosin.executor.func.blacklist "passthru, show_source, shell_exec, system, pcntl_exec, popen, pclose, proc_open, proc_nice, proc_terminate, proc_get_status, proc_close, leak, apache_child_terminate, posix_kill, posix_mkfifo, posix_setpgid, posix_setsid, posix_setuid, escapeshellcmd, escapeshellarg"
so that it includes the rules I'd originally placed in .htaccess? Also, will this edit provide what I'd originally intended to do (www to non www)? 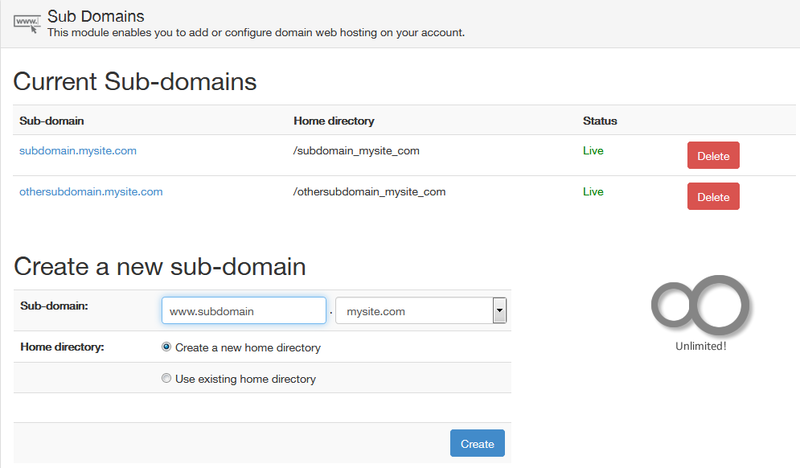 thinking that it just might create a sub-subdomain, with the directory placed neatly in public_html. But, of course, that didn't work. tell me that rewrite_module is loaded. Guys you can have a look on my post here. (http://forums.sentora.org/showthread.php?tid=10120) I have posted the solution there.